Finally - the announcement you have all been waiting for! We have eight new, super talented ladies joining our already inspiring design team! Help me make them feel welcome, will you? And to find out more about them, view their biography's here, or click on their name/picture to check out their blogs and the amazing work they've been doing. Welcome to the team girls!! We are honored to have you as part of our team, and excited is an understatement! They will be making their first DT challenge very, very soon!! Have you met the original team? If you would like to click here. If you haven't already entered, the cut-off time is Wednesday June 30th midnight WST and you can submit your entries HERE. This week at Just Add Ink, we're saying a fond farewell to one of our original Design Team Members, Nicole McMurtrie. As you may have read in Nicole's profile, she's been busily setting up her own line of boutique children's decor and accessories, as well as the most adorable clothes! If you haven't already, please visit Nicole's facebook page for My Flutterfly - you won't be disappointed! and we all wish you the very best in the future and with My Flutterfly! We'll be looking for you in the challenges! Hope you're ready to get into your stash!! This week we're being super flexible and are already excited about what you clever readers are going to submit! Make a papercraft project as per our challenge - a card, scrapbook layout, 3d object, etc. While the DT uses Stampin' Up! products where possible, you're welcome to use any products you like. Please use the keyword JAI23 when uploading to public galleries. 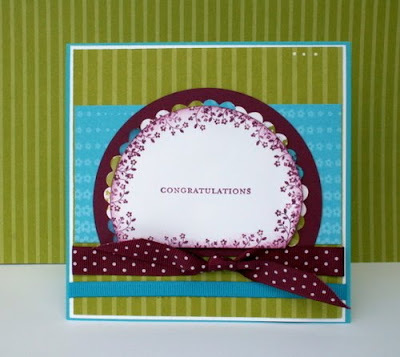 Your creation must be exclusive to our Just Add Patterned Paper challenge. Entries with 3 or more alternative challenges listed (ours included) in the post will be deleted at the discretion of the JAI hosts. Mr. Linky will close Wednesday June 30 at 23:59WST. Be here on Thursday July 1 to see our Top Picks and meet the new Design Team! Thanks to everyone who played along this week, we loved looking at all your beatiful creations from our colour combo challenge - they were all truly amazing! As you know, we've just asked you stampers to apply for our design team if you have a little spare time up your sleeve (or even if you don't). An update: we have selected 8 new team members to add to our already super team. We had 32 incredibly talented girls apply but you know how these things go - while we would love to have the "worlds biggest design team" ... we couldn't. Needless to say, the decision process was bitter sweet. Regardless, we hope you will stick around to make our challenge outcomes interesting!! We will be revealing the new teams very soon, so stay tuned. Without further ado, here's this weeks top picks (in no particular order). Be sure to click on their name and visit/comment on their work, everyone appreciates a little comment love! A little while ago, we had a great question from Amanda Ross for our Design Team. Amanda asked: "I would love to know when the Design Team ladies find the time to scrapbook and also where they get their inspiration from?" I make time to scrapbook and create every day. Id much rather create than do housework that's for sure! I don't like to create at night as that is my family time/computer/Tv watching time ..not that I watch a lot of TV! ..and as I'm a dairy farmer too I am often too tired to create at night time. I create during the day while my kids are at school and any farm work is out of the way (eg milking the cows). I LOVE milking the cows and plan my day/ Layouts or projects I'm going to create that day. I have the radio on in the shed and often a song lyric or title will pop into my head and I'm sketching my LO on the whiteboard in between cupping!! My hubby thinks I'm nuts! I am also inspired by fabrics, advertising and especially colour combos I haven't tried yet. My blog surfing at night also gives me inspiration especially if its a technique I haven't tried before. 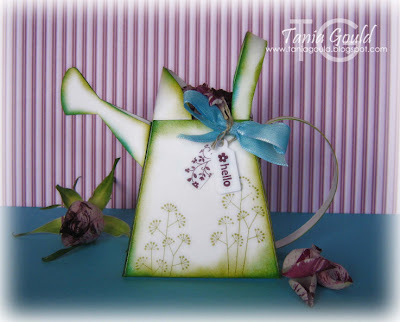 I love being on Just Add Inks Design Team because I also get inspiration from my fellow DT members and the lovely creations you all provide each week in your submissions. I love to spend time at night with the tele on, kicking back relaxing while researching for ideas and new techniques through places like Splitcoast and or random blogs etc on the laptop. I now only create in the day time but I used to be only able to create in the evenings - weird! I tend to get an idea pop into my head and I cannot shake it until I make it!!! Sometimes it works - sometimes it doesnt. Generally I take inspiration from others work - I pick bits I love from here and there and put it all together! I dont have a set time to create, if I feel creative usually wild horses wont keep me from my supplies, but if the mojo isnt there, it just doesnt happen but I am always super encouraged when I make something I really love, then I can't help but make something else and the ball keeps rolling! I'm in my Craft Room all the time....so much so that my sister calls it "The Black Hole" and my daughter calls it "Mummy's Bedroom". I am always in there pottering around on the next project - especially if there is something I am bursting to make or finish. Although most of my serious crafting time is at night - after my daughter is in bed. Occasionally I will squeeze in a morning while she is at school - although I try to ban myself from "The Black Hole" until I have completed the housework. My Inspiration comes from just about everywhere. There are so many things that trigger an idea - it could be something on TV or in Magazines, in Gardens and Shops, Ads, marketing material and occasionally even something I've dreamt about! (Sad when you dream about Crafting)! 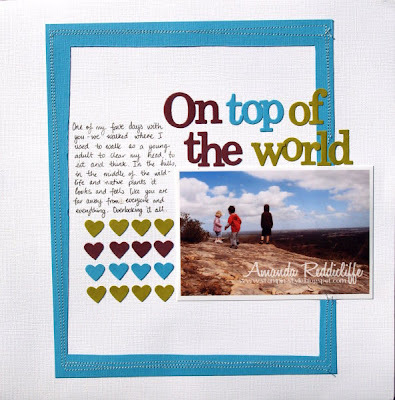 I get alot of inspiration from other Scrapbookers and Card makers too. I often take several ideas from others and put them together....a layout from there, a colour combo from here, an embellishment idea from somewhere else etc. 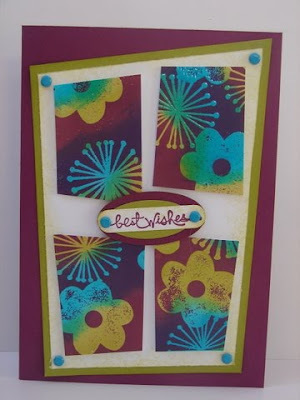 I find entering Challenges is a great way to extend your Scrapbooking / Card Making ideas and can take you outside of your comfort zone - it provides opportunities to try new things. I've taken over the entire Rumpus Room as a craft area and spend most of my Mondays in there and the occasional hour or two on the weekends. I work 4 days a week so don't get a lot of time to create. I try to get a group of friends together one night of the month so I don't always craft alone between workshops. At the moment most of my time is taken up with JAI commitments and SWAPS for Convention. There's about 4 different designs on the go at the moment, all in various stages. A friend of mine has offered to come around and help me glue, snip away etc. so I can get my SWAPS done as well as all my school reports etc!! I try to keep nights free to spend with the family but sometimes deadlines keep me tapping away on my netbook in front of the hours of recorded programs I don't have time to watch live and am nowhere near caught up on. Blogging and surfing the net is more fun than watching TV. That's where a lot of my inspiration comes from. I have my favourite blogs on my side bar that I try to visit weekly. I usually either follow or subscribe to them so I know straight away when they update. The Ning Network for the JAI team is full of inspiration (talented bunch of women) and you get to see the results of all their hard work on Fridays!! I also spend hours on Splitcoast mostly looking for new techniques. Of course I'm also inspired on a daily basis as I visit the blogs of all the challenge entries. I have taken heaps of notes about favourite colour combos, techniques, sketch designs etc. and store them away for a 'rainy' day. Now that ESAD is in Ning it's heaps better to view all the lovely work in the gallery. There's so much talent there and I'd love to see some more of those Aussie/NZ demonstrators joining in the challenges at JAI as well. I buy the Aussie Card Making and Papercraft Magazines too, get ideas from SWAPS I've collected, challenges I enter, the Impressions' Magazine and the SU demo site. Lastly, I must admit that I see the world through Stampin' Up! colours and practically everywhere is 'inspiration'. My mind is constantly ticking over with ideas for layouts, colours etc. and I have to sketch or write it down before I forget. I find the only time I can give 100% to csf (crafting stress free!) is when the kids are asleep, or busy crafting themselves, but even then I find I'm supervising and helping more than getting anything done myself. So night time, with a bit of background music is the perfect environment for me to work! I get my inspiration from so many places - I love how the internet is full of so many talented ladies sharing their ideas and inspiration, and I admire them all too! And as biased as this sounds, I love Just Add Ink for our little group of talented players - the group is getting bigger as the weeks go on but every single person that plays has their own unique ideas, style and talent - and most of the stamp sets they use are accessible for Aussies for a change! I used to buy magazines, but have found that most of them are getting so expensive and you can find even more daily inspiration on the net! It is difficult to find the time to stamp and scrapbook with a toddler and a newborn but I make sure I find the time, at least a few times a week. Like Kirsty, once the kids go to bed around 7 I make myself a cup of tea and head to my craft room. I try to keep my craft room full of inspiration, with my magazines, laptop (for blog surfing) and cards close by and on display. A lot of my projects are for my children. I am inspired by colour schemes in their toys, bedding and books. As for card and scrap page layouts and colour schemes, I love to browse through my magazines, the Stampin' Up Idea Book & Catalogue and blogs for ideas. I'll often take part of a layout that I like and change it to suit what I am doing. I feel the most creative and inspired when I am up to date with the housework and other jobs and I can think clearly. I'm a notoriously slow scrapbooker, and I'm discovering that I really need to be alone to get a page finished. I love having craft time with friends, but I rarely get anything accomplished! I also usually have lots of projects happening at once, so it will seem like I'm not getting anything done for a little while, then all of a sudden I have lots finished! I'm lucky enough to have a craft space that also accommodates my daughters play area, so I often craft while she's playing, or she sometimes crafts with me. She's 3 and already she loves using the Big Shot! I also craft after she's gone to bed... there aren't many days that I'm not doing something! My inspiration wavers a lot, but mostly I'm inspired by other crafters. Not necessarily one project, but usually their entire style. Do you have a question for the Design Team? and we'll do our best to answer it! If you haven't already entered, the cut-off time is Wednesday June 23rd midnight WST and you can submit your entries HERE. 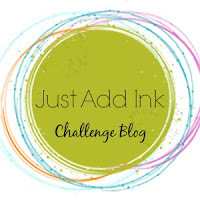 Just Add Ink #22 - A Colour Challenge! 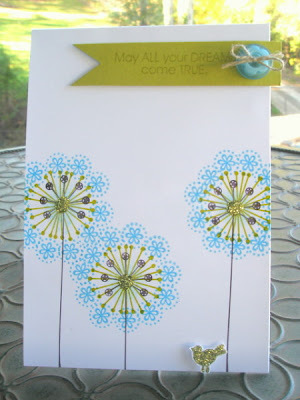 We have a wonderful colour combo for you this week designed by Bronwyn Eastley - isn't it fun and refreshing? Perfect for these wintery days that keep us inside (stamping, darn it!) but alas, usually drives the kids crazy. We hope you will have some fun with it! Make a papercraft project - a card, scrapbook layout, 3d object, etc. Provide a DIRECT LINK to the post on your blog where you've displayed your creation using Mr. Linky. Incorrect links will be deleted. Your creation must be exclusive to our colour challenge. Entries with 3 or more alternative challenges listed (ours included) in the post will be deleted at the discretion of the JAI hosts. we'll publish it and add it to Mr Linky on your behalf. Mr. Linky will close Wednesday June 23 at 23:59WST. Be here on Thursday June 24 to see our Top Picks. Thanks to everyone who played along this week, we loved looking at all your beatiful creations from our sketch challenge! If you haven't seen it already we're looking for new SU! Demonstrators to join our Just Add Ink Design Team, we've already had some wonderful girls apply (thank you, we'll be in touch soon!) but to be fair to everyone I thought I would mention it here again. Applications close midnight Monday, more details are in the next post down so be quick and drop us a line. Here's this weeks Top picks ... be sure to click on their name and visit/comment on their work, everyone likes a little comment love. Come back at midnight to check out our next challenge - a refreshing colour scheme to brighten up these wintery days!